150,000 new-borns and their mothers will receive a comprehensive package of care to ensure they survive and thrive, including over 9,800 mothers and their new-born babies in Hela province. 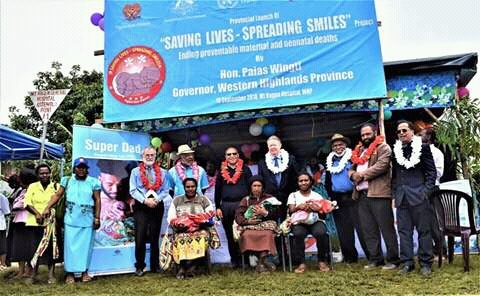 HELA Province has joined two other provinces in introducing the ‘Saving Lives –Spreading Smiles’ Project designed to save lives of newborns and mums dying in childbirth. Also present were NGOs, churches and development partners, including the Australian Government which was represented by Australian High Commissioner Bruce Davis. Australian Government is funding the roll-out of the project which was launched at the Parliament State Function Room in September last year, following a successful pilot project in the Eastern Highlands and the Port Moresby General Hospital. The aim of the SLSS is to equip health workers with appropriate skills to manage most common maternal and new-born illnesses and provide referral services for sick mothers and new-borns. At the provincial level, a state-of-art Special Care Nursery and Kangaroo Mother Care Unit will be established to provide specialized care to sick new-borns. All 32 health facility staff in Hela Province will be trained and equipped to manage sick mothers and newborn. Mr McCloughlin congratulated the Hela Provincial Health Authority for launching the programme. He said the funding support of the Australian Government will ensure that over 150,000 new-borns and their mothers receive a comprehensive package of care to ensure they survive and thrive, including over 9,800 mothers and their new-born babies in Hela province. He said far too many babies die within the first month of their lives when they are most vulnerable. “An underlying cause of these deaths is neonatal hypothermia or low temperatures in babies, particularly in Highland areas (now it is very cold for us). With the help of an innovative hypothermia monitoring device, locally known as the Bebi Kol Kilok, up to 42 per cent of these deaths can be prevented when parents and caregivers provide the correct care for babies whose temperatures drop. PNG could successfully demonstrate the use of Bebi Kol Kilok to save new-borns lives from the major cause of hypothermia and related complications,’’ he said. Mr McCloughin also called on the relevant authorities, particularly the provincial governments to allocate necessary resources to strengthen health education and community mobilisation alongside proper referral and transportations systems to ensure maximum impact. He said this program will only go far when there is support from the civil society organisations, the churches, NGOs and the private sector.